That analysis was the genesis of the agency's African American Mentoring Initiative Advisory Council, now known as the AAMIAC (rhymes with maniac). This is a group of recruitment rock stars. Every goal this group has set for itself, it has met. The goal to raise $10,000 for recruitment material, and the goal to recruit 100 mentors. The most critical component of the council has always been its leadership. One of its early leaders was a man named James Blair. 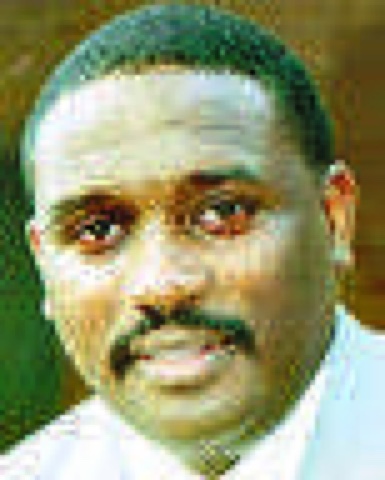 Mr. Blair died unexpectedly in 2011 at the age of 51. In order to honor his legacy as a part of the successful AAMIAC, Big Brothers Big Sisters created the James Blair Award to be given away each year on April, Volunteer Appreciation Month. This year the council selected Mayor Ivy Taylor to receive the James Blair Award for her commitment to youth development and mentoring. 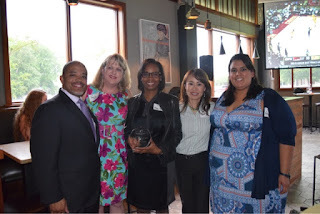 Mayor Taylor is a long time Big Sister volunteer and is on the Advisory Board of Big Brothers Big Sisters of South Texas. 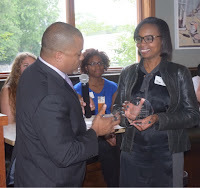 The organization is very pleased to honor the mayor with this award which it presented to her at its April volunteer appreciation mixer at Francis Bogside surrounded by other Bigs and BBBS supporters. Congrats! If anyone is interested in being a mentor and/or joining the AAMIAC and helping to recruit more mentors of color to be Bigs, call 210-225-6322. You can read more about James Blair here.